Electrology made its debut in 1875—but it has come a long way since then. Considered a hair-by-hair process, a nurse inserts a tiny needle into each hair follicle to destroy the hair. Heat from the needle creates a chemical reaction—then it produces a caustic reaction inside the follicle to destroy future hair growth. Electrology is considered the only permanent solution available for light hairs such as reds, whites or grays. Often after a series of laser treatments (where, about 80% of the hairs are permanently gone) some electrolysis is required, as the hairs are so damaged by the laser and the target so small from the damage, that electrolysis is the only way to get rid of this last 20% or so. After treating each hair, we then remove it with tweezers. The skin may have some redness and follicular edema (hair follicle swelling) lasting about 2-4 hours. Why some people choose laser treatment instead? Laser feels better, electrology is more intense. To increase your comfort level, our nurses administer a local anesthetic that numbs the skin. Arrive a few minutes early to complete some paperwork—medical history, current meds and contact information. An RN will ask you questions, review medical history and pinpoint your needs for services. 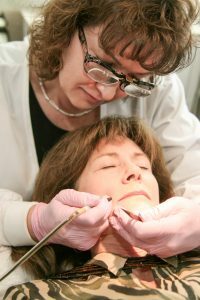 A treatment assessment will help the RN decide whether laser or electrology or both options are best for you. Next, we will explain the pre and post treatment instructions, precautions and the best treatment plan for you. Prior to treatment, the consent for treatment form must be signed. Want to move forward after the consult? Arrive a few minutes early to complete some paperwork– medical history, current meds and contact information. Size of needles–tiny. About the size of a hair. We use sterile (autoclaved) tweezers and cap holders. The electrologist will always wear a mask and gloves. Magnifying glasses are sometimes used to insure a complete, accurate, effective treatment. After treatment, the area is cleaned with refreshing tea tree oil to decrease inflammation and jump-start the healing process. Treatment area may appear red for 2-4 hours, whereas laser treatments may produce redness for up to 24 hours. Electrology procedures often produce more redness and bumps than laser treatment. For complete clearance of hair, we recommend continued treatment at 1-3 week intervals for about 6 months to 2 years. It all depends on how much hair you have. Genetics and hormones influence to grow hair as well. i.e. PCOS or other hormone imbalance. Book your next appointment at the front desk, online or call for an appointment. Interval times range from about 1-4 weeks in between treatments and often increase after the first few treatments—that means scheduling treatments out longer. That depends on hair density and the size of treatment area. Usually ranges from 10 to 90 minutes. See below for time estimates. If redness lasts longer than 6-8 hours and appears treatment related, please contact us to discuss further care options.